Flutter your way into big payouts and colorful gaming fun with every game of “Lil Lady” slots. This is a five reel and massive forty payline game that offers up flexible wagering options, bonus features, and free spins as well. The coin values available range from five dollars to one cent each, meaning a penny slots fan or a high stakes player could both enjoy this game equally. Consider that a one penny wager on each of the paylines can provide a jackpot winner with a ten dollar prize, or a high stakes gamer could walk away with five thousand dollars for a full wager as well. The images and icons used to illustrate the cute insect theme include the lady bug, love bug, flower, mushroom and the classic A, K, Q, J, 10 and 9 symbols too. 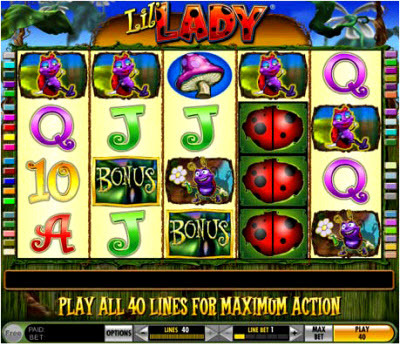 The wild symbol for “Lil Lady” slots is the lady bug image and it substitutes itself to complete any winning combinations along the paylines in which it appears. The symbol is also a “stacking” one, which means that if it hits a reel it can appear up to four times on that single location. This makes it much more likely that bigger winnings will be taken through a wild combination. The scatter symbol is the distinctive “bonus” icon and will also create winning combinations when it appears on the screen. This image does not have to fall along the active payline, but it is limited to only reels two through four. All scatter payouts receive single multipliers of the original wager, which means that winnings are usually twice their original amount. When three or more scatters appear along reels two through four the player is also taken into the free spins bonus round which gives them five initial spins. More free spins can be won during this round with a limit of two hundred and fifty-five in total. All wild and scatters remain active in the free spins round, and stacked wilds go from four to five icons along the single reel. This makes it much more likely that additional spins and extreme winnings are possible during the bonus feature. Prize payouts for “Lil Lady” slots are determined by the number of matching symbols that fall along a single payline. When there are five symbols the payouts are one thousand coins in the amount wagered for the lady bug, four hundred for the Lil Lady or the love bug, two hundred fifty for the flower or the mushroom, one hundred fifty for the Ace or King, and one hundred for the Queen, Jack, 10 and 9. When there are four symbols on the payline the prizes are two hundred coins in the amount wagered for the lady bug, one hundred for the Lil Lady or the love bug, seventy-five for the flower or the mushroom, fifty for the Ace or King, and twenty for the Queen, Jack, 10 and 9. When there are three symbols along a single activated payline the prize payouts are fifty coins in the amount wagered for the lady bug, twenty-five for the Lil Lady or the Love Bug, twenty for the flower or mushroom and five for the Ace, King, Queen, Jack, 10 and 9.